Ambassador of India to Indonesia H.E. 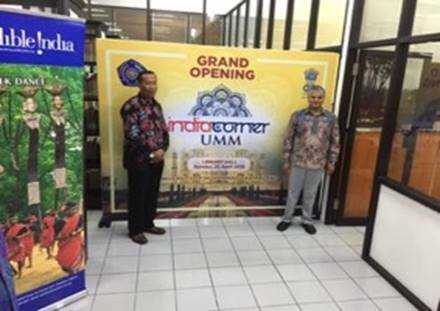 Mr. Pradeep Kumar Rawat and the Rector of UMM also inaugurated an India Corner at the University. The India Corner is a special section created by the University, which showcases Indian books, Indian Literature and news about Indian arts, culture and tourism. Ambassador in his remarks hoped that the opening of India corner, would facilitate better appreciation among students of UMM about India and the opportunities it offers. The Rector of UMM thanked Ambassador for opening India Corner at UMM. He said that it was in line with UMM’s policy to give maximum exposure to its students as they had Corners of other countries as well and the opening of India Corner would definitely benefit its students.